Same acronym, but different technologies. dmidecode might already be installed with your distribution. Just run dmidecode from the command line. If not installed, check the repository using Synaptic or install from the command line. dmidecode requires root privileges. That means sudo. “Permission denied.” dmidecode requires root permissions. Shown here is an attempt to run it as a regular user. By default, dmidecode returns everything it can find in a single listing. Shown here is a small section of hardware information regarding the onboard motherboard devices and CPU cache information. 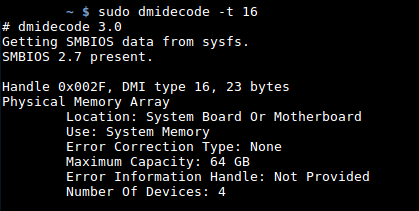 The hardware shown by dmidecode is not live information. 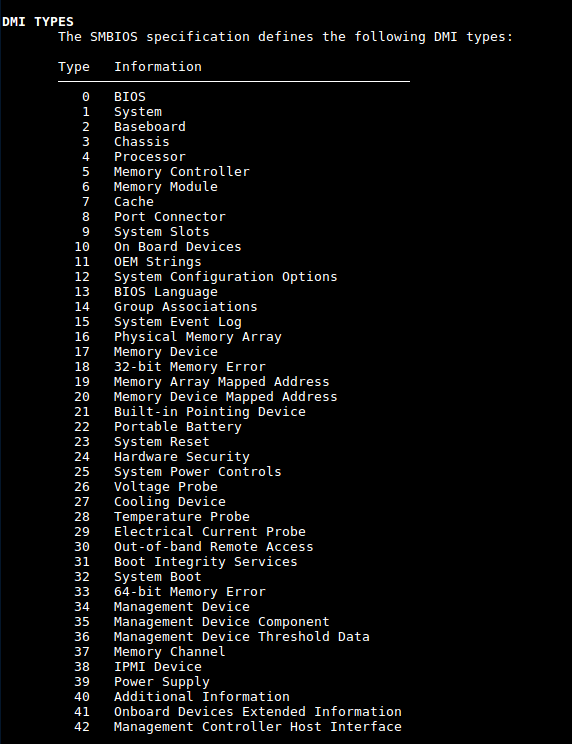 Instead, it returns the hardware information about your system stored in tables. As a result, some of the data might be outdated or inaccurate. In fact, the man page warns about this. 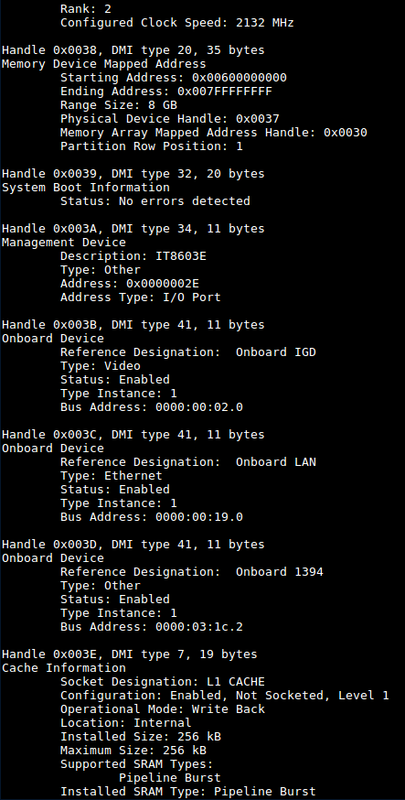 From my use, I have checked the results of dmidecode with the actual hardware specifications, and all information was mostly correct. A few minor inconsistencies did appear, but nothing deal-breaking. dmidecode remained useful. Your usage might vary depending upon your hardware and system. 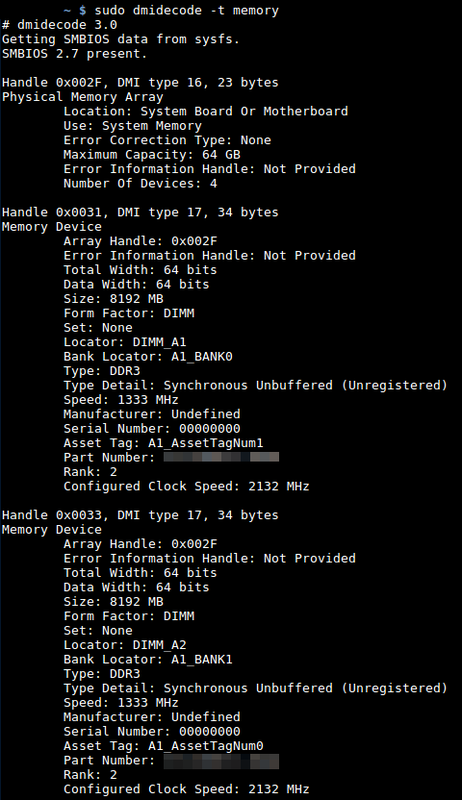 dmidecode returns a wealth of hardware information. We can limit this by specifying types. dmidecode will return information for the given type. There are nine type names. Use these with the -t option. Shows how many RAM slots are on your motherboard, the maximum memory supported, which slots are populated, and details about the modules installed. Partial memory listing. All memory information is accurate for this system. The motherboard supports up to 64GB or RAM, and the slots shown are indeed populated with the correct RAM. Even the RAM part number is listed (pixelated here for privacy). This is convenient because if you need to order more RAM of the same type, you can easily get the part number without needing to open the computer case. If you need to see what connectors are on your motherboard, use the connector type. All connections, including audio and fan headers are listed. This does not tell whether or not a device, such as a fan, is actually connected. It only shows that these ports exist. 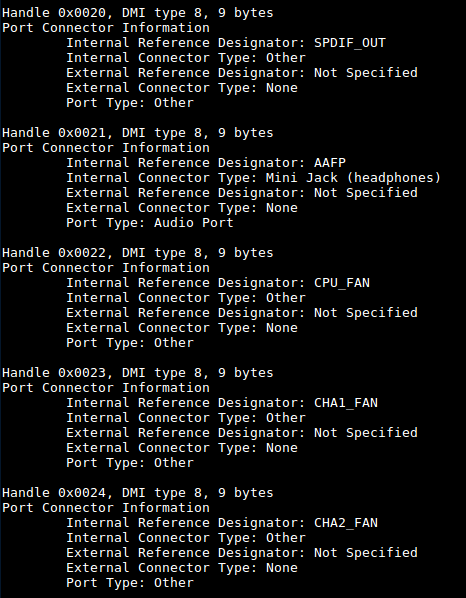 For this example, the labels (CPU_FAN, CHA1_FAN, and so on) are the same as stated in the motherboard manual and on the motherboard itself. What expansion slots are available? The slot type will list all physical expansion slots on the motherboard and which slots are available or in use. The labels are the same as printed on the motherboard. Here, we see PCIEX16_1 “In Use” because is contains the graphics card. 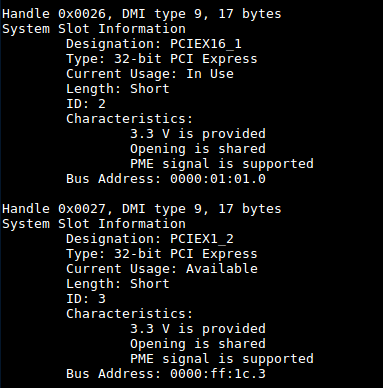 PCIEX1_2 is empty on the board, so dmidecode marks it as “Available.” Other details are provided for those who need them. Type and Length seem to be wrong, however. Experiment with the other type names to see what information is returned. For example, the processor type returns plenty of information regarding the CPU. What Does “DMI type 9” Mean? dmidecode returns a type number above each set of results. The keywords, memory, connector, slot, processor, and the others, simplify access to hardware information. We can use numbers instead. The man page lists 42 numerical types. dmidecode numerical types. We can also use these with the -t option. Both return the same memory slot information. Same memory information returned using type 17 instead of the memory keyword. The numbers make it easy to grab specific information without viewing the entire hardware listing. For example, if you only need memory array information and not all slot information, just use type 16. This is useful if you only what to find out the maximum RAM supported on the motherboard without sifting through a list of slot information that would normally be returned by the memory keyword. Number of Devices means that there are four physical RAM slots on the motherboard. You can combine numerical types by separating them with commas. This returns the information for type 16 (memory array) and type 10 (On-board devices) together. Note that the order displayed is not always the same as the order of command line options. Any types that return empty information will not be shown. Depending upon your system, some types will return empty results. This is mostly trial and error, so have fun experimenting! 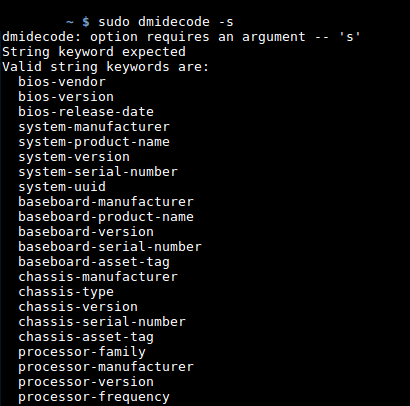 dmidecode also recognizes a limited set of string keywords that return specific results, such as process-frequency, bios-vendor, and system-uuid. Use the -s option. No need to specify a type. Use grep (or egrep) if you need to grab a specific string not included in this limited set of keywords. Returning only the maximum RAM capacity supported by the motherboard. awk is one way to fine-tune the results so only the 64 is returned. Linux is all about choices. 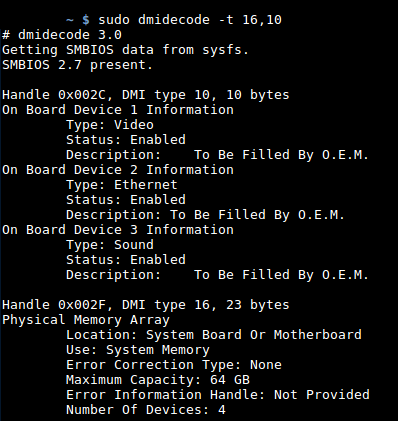 Many other programs exist that return hardware and system information, and dmidecode is a good addition to any toolkit. You might find yourself stuck at a terminal without any GUI help, and dmidecode just might be the program that returns exactly what you need. So, it is always beneficial add another utility to your knowledge. This entry was posted on August 28, 2017, 4:33 PM and is filed under linux. You can follow any responses to this entry through RSS 2.0. You can leave a response, or trackback from your own site.